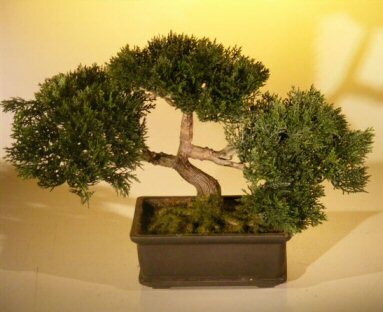 Artificial Japanese Cedar bonsai tree. The Ficus Benjamina is an indoor tropical bonsai tree that is easy to care for. Has large evergreen leaves with a pointed tip that can be reduced in size by trimming. Trimming will also keep the tree tight and compact as will direct sun. This is the tree that we recommend if you are inexperienced with bonsai or you do not have a green thumb. In our opinion it is one of the easiest bonsai trees to care for and is a very beautiful "trouble-free" evergreen. If you don't know which tree to purchase as a gift for someone, this is the tree to select. This versatile tree is great for home, office, dorm or anywhere and does well in low to high lighting conditions. Our tree features tiny umbrella shaped leaves forming a dense green variegated canopy. Very popular and easy indoor care. Our Hawaiian Umbrella bonsai tree with banyan roots is truly a work of art by mother nature. Anyone would be proud to own this impressive conversation piece. Citrus Paradisi, "Citrus of Paradise". is the botanical name for grapefruit and is the state fruit of Texas. Melogold is a hybrid of acid-less pummelo. The exterior peel texture is smooth to slightly pebbled. The seedless flesh is pale yellow, tender and juicy with a slightly flattened base. Melogold produces 2" white four-petaled, fragrant blooms. The rind is medium to dark yellow in color. The large fruits typically average one pound in weight. The flavor is mild, sweet and reminiscent more of pummelo then of grapefruit. Great for indoors.